Ducom’s Rotary Tribometer is a must-have workhorse instrument, already in use in several tribometry labs. It allows for real-time measurement and determination of the frictional properties, and gradual wear, of different samples. It can be used with designs in ball-pin form, or else for disk specimens. The flexibility of the instrument allows for you to test the samples in dry or lubricated condition, and regardless of the hardness or roughness of the sample. Experiments can be conducted in dry or lubricated condition. There are three key variables which can be controlled across a wide range of values: the load, speed and motion are three important variables. The design allows loads from: 2 N to 1000 N, which can be set manually or via computer-controlled profiles. 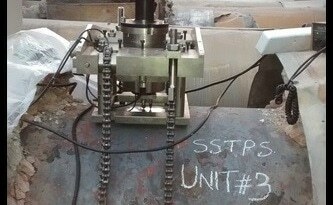 The speed can be varied between 0.3 rpm to 3000 rpm (computer controlled profiles), and the tribometer provides three different types of wear profiles (rotation, spiral and oscillation). Ducom’s Rotary Tribometer is made up of environment control modules which allow for features like heating (up to 1000 deg C), vacuum (up to 10-6 Torr) and humidity (up to 80 % RH). It complies with ASTM G99. Figure 2. Dry and lubricated test conditions (A), Wear profiles – oscillation, circular and spiral (B), Independent ball and disk heating at 800 °C (C). Determining and plotting Stribeck curves will allow you to map the lubricative properties of oils, both with and without viscosity modifiers and additives. These same Stribeck curves can be plotted for food additives and beverages as well. Examining the friction and wear of metals as they undergo forming and reforming at high temperatures (up to 1000 °C). Quick tribological characterization of coatings like TiBN, TiN, DLC, WC, PCD, etc. Examining the tribology of materials in a vacuum or at high temperatures using the environment modules – which could be useful for space applications. For loading the pin/ball onto the disk, you have the option of a computer controlled pneumatic loading unit or a servo-controlled unit. There are three different preset modes that can be used: ramp, step or continuous loading. You can also design software driven sequences of load profiles and speed, up to a maximum of 1000 N.
Servo-motor controlled disk motion allows the tribometer to achieve multi-direction motion. This means it can examine wear profiles like rotation (clockwise or counter clockwise), oscillatory profiles, or spiral wear profiles. You can control the speed profiles with software to allow you to plot Stribeck curves, using user-predefined speed profiles including ramp-up. This tribometers’ maximum speed is 3000 rpm. Furnace or joule heating methods can be used to heat up the pin/ball mechanism to high temperatures, up to 1000 °C. Using the Joule heating method, accurate final temperatures can be attained for the pin/ball mechanism. A leak-proof metallic enclosure combined with turbomolecular and suction pumps can allow you to achieve an ultra-high vacuum of 10-7 torr – around the disk testing area for the pin/ball mechanism. A three electrode potentiostat allows you to generate linear polarization curves according to ASTM G59. This then lets you determine the wear and mass loss profile due to the corrosion and mechanical wear on the device. A closed chamber allows for the control of humidity, taking values between 30 % to 75 % RH. Solenoid valves and two air columns in the chamber generate dry air and generate saturated (humid) air using a compressed air supply; this allows the humidity to be controlled in the tribometer’s environmental module. The lubricant module consists of a lubricant pump, nozzle and splash guard. There is also a recollection unit, and the lubricant cup is big enough to accommodate the test sample. The tribometer measures the contact resistance and friction between the pin/ball and disk using an electrical, voltage-drop method. All of the holders are made of non-conductive materials to minimize noise. The resolution of the force (friction or load) is 1% of the maximum value in a given range. For example, the friction force resolution is 0.6 N for a friction force measurement range of 0 to 60 N.
The resolution of the linear wear is 0.1 % of the maximum value in a given range. 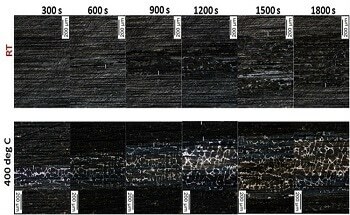 For example, the linear wear resolution is 2 µm. Modular system: Due to the modular nature of the system, the pin-on-disk unit can be replaced or upgraded with any of the optional features listed above at any point after purpose. Applicable for multidisciplinary research: This system has uses across a range of different tribology studies. Examples include automotive tribology – for example, the friction and wear of brake pads, bearings, tool materials, as well as examining the fuel economy and lubrication of the fuel materials. It can be used to examine space tribology (using the vacuum chamber), and assorted lubricant tribology (engine oils, fuels, greases, etc.). Further still, the setup can be used to analyze bio-tribology – Stribeck curves and friction profiles for polymers and food additives, for example. Low maintenance cost: Ducom prides itself on high-value design instruments, which – alongside the quality of components chosen – ensures that the maintenance costs are low. For example, if users utilize the joule heating rather than the furnace heating, the lifetime will be greatly increased. As well as this, online support when required is free. Ease of calibration: The calibration of the friction and normal forces on the device can be done using a simple known weight and a loading pan; this calibration technique is well-known and doesn’t require specialists to perform. The table covers the spare parts that is already included in the instrument. You have to place an order for additional units and optionals. Fortune 500 companies, from small research laboratories to major R+D departments in large companies, use Ducom for tribological tests. There are a number of different tribometers, mechanical testers and lubricant testers at three locations: including in India, the Netherlands, and the USA. Ducom will allow you to remotely witness tests by video, saving on the costs of having to travel to these facilities in person. These test facilities have been in service since 1999, providing tribological testing facilities to academica and industry alike. The tribometers used by Ducom are state-of-the-art and regularly calibrated to ensure that their results are accurate and reproducible. Even in the field of tribological testing alone, the staff at the Ducom Testing Facility have over fifty years of combined experience with this state-of the art equipment. With Ducom, you can get your testing done without capital investment or additional manpower requirement. Using their centralized facilities, you avoid the need to train testers, and avoid maintenance and AMC costs for the equipment. In addition, they provide excellent security; the facility has limited access and non-disclosure agreements are available. All tests will be reported in accordance with existing standards.